Yes, I know, I haven't had much to say lately. I bought myself a new toy, and I've been playing with it for the past few weeks. 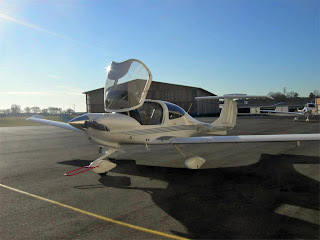 This is the Diamond DA-40. It's not brand-new, but a 2005 model is close enough ... the Cessna I flew before was vintage 1985, so stepping into the Diamond is literally stepping into a new century of aviation. Well, OK, it was designed in the 1990's, but you get the point. 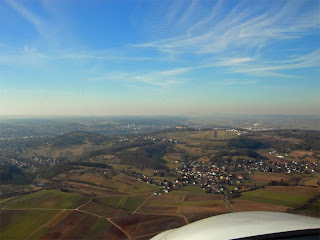 Here's the view out the front ... much better than the Cessna 172 I used to fly. And this one actually has a heater that works, so you can fly it on cold winter days. 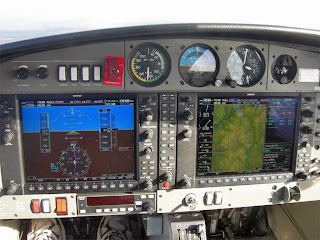 However, I have moved up to what is popularly called a "glass cockpit" ... the Cessna had what are derisively called "Steam Guages," which are the round guages you see at the top of the panel ... the Diamond has them as back-ups in case the electronic panels quit on you. I even had Steam Guages in the Air Force (shows you how old I am), so the new layout takes a little getting used to. The Parterin is amazed at all the buttons I have to push ... Actually it's not as bad as it seems, though the money a lot of people spend to learn the Garmin 1000 system is no doubt money well spent. I, of course, decided to do this the hard way, which is not too bad on a clear, sunny day. Oh sure, I go out and buy myself a new handbag and you buy...an airplane. Hubby flew with the glass cockpits the last few years before he retired. He says they were good, but his favorite plane is still the L-1011. He flew that back with Pan Am, before going to Delta.